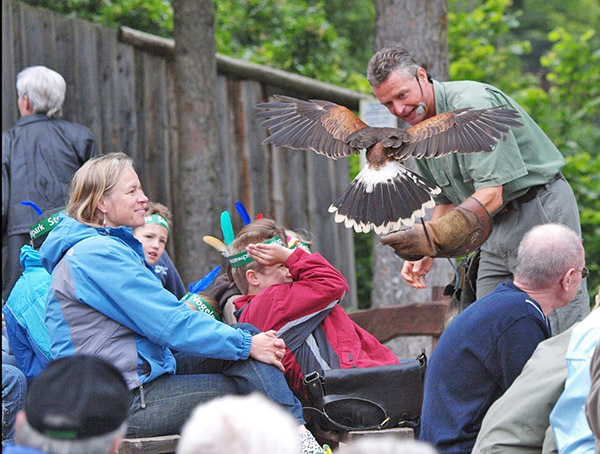 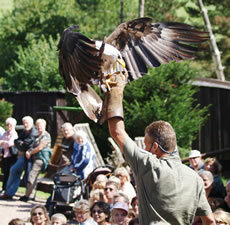 The falconry area with approximately 600 seats is situated near the park entrance on an easily accessible raised area. 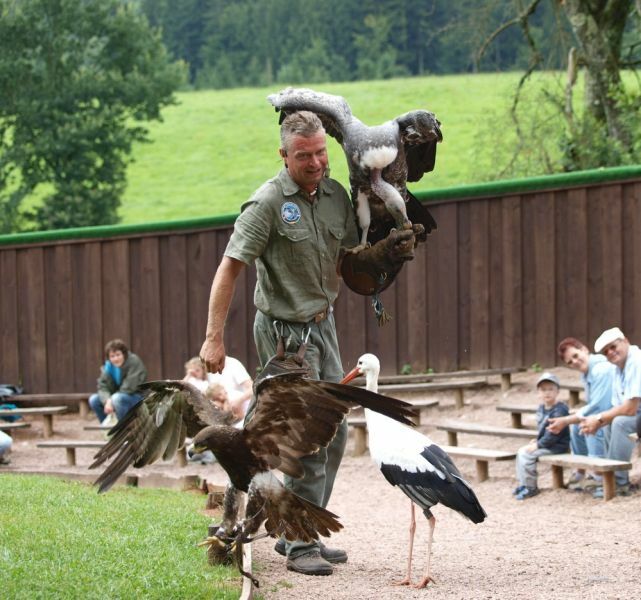 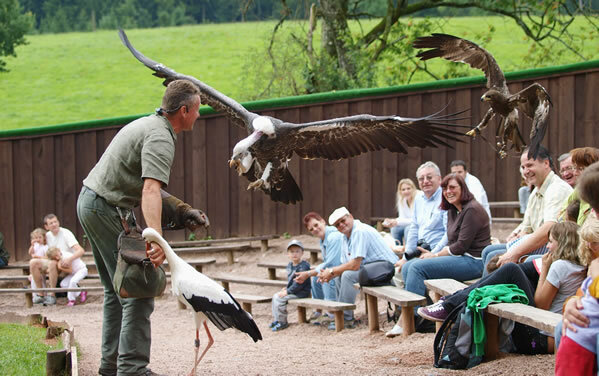 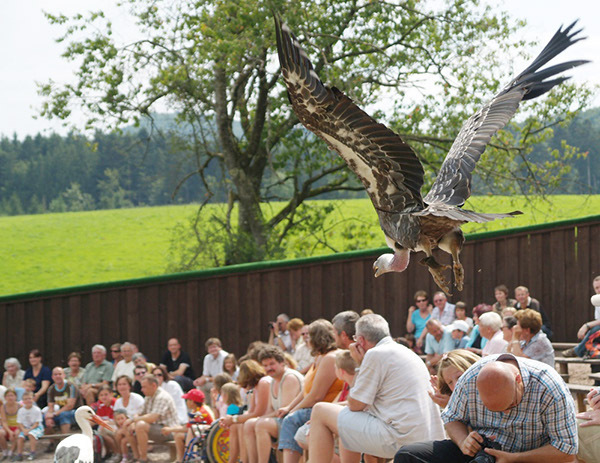 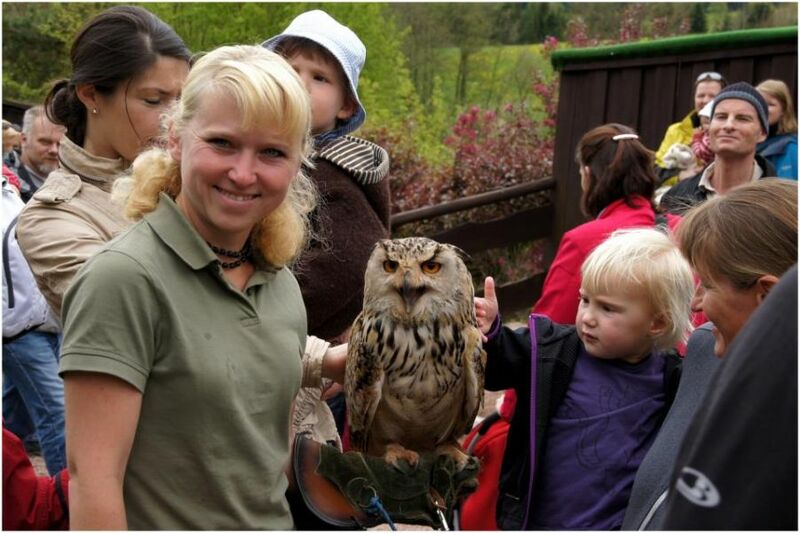 It offers a wonderful view of the beautiful countryside surrounding the Bird Park of Steinen. 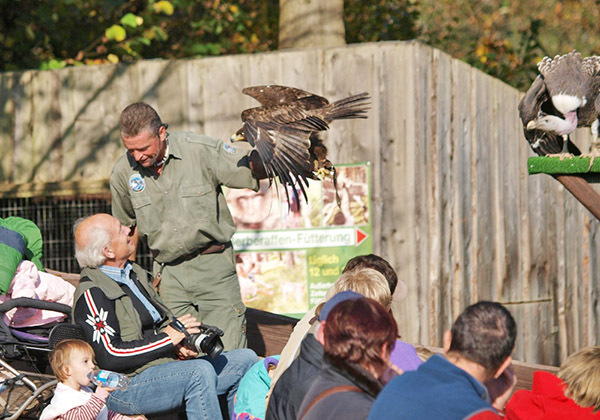 A special event for young and old alike is the amazing, daily bird of prey displays with eagles, falcons and owls at 11am and 3pm. 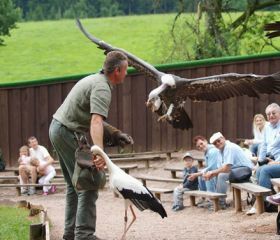 approximately 40 minutes, unique in its presentation. 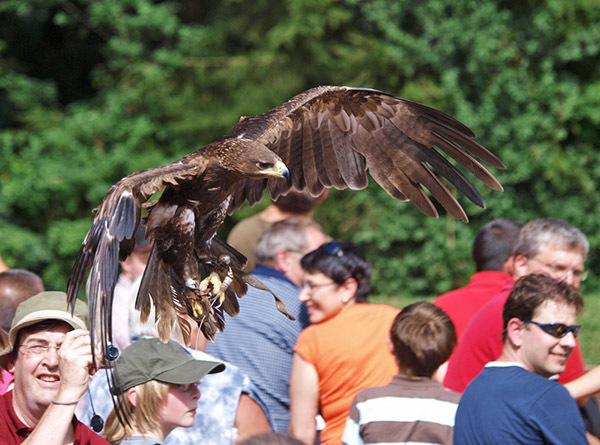 Here you can learn everything worth knowing about falconry and the birds of prey, as well as the protection of birds of prey, the dangers facing birds of prey, their particular abilities and the significance of the birds of prey for the balance of nature. 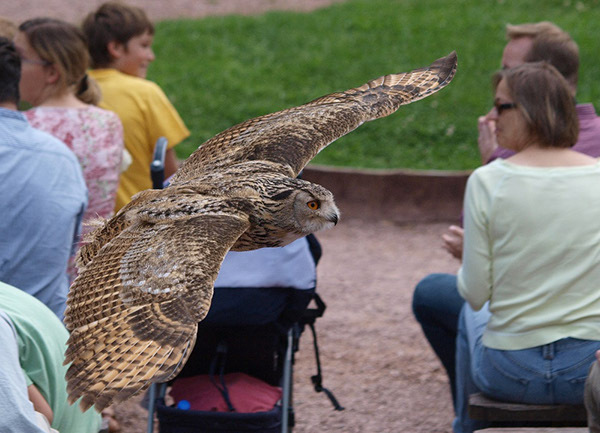 To ensure an undisturbed Birds of prey flight display visitors to the park must use the entrance to the falconry by means of the path marked with dog symbols. 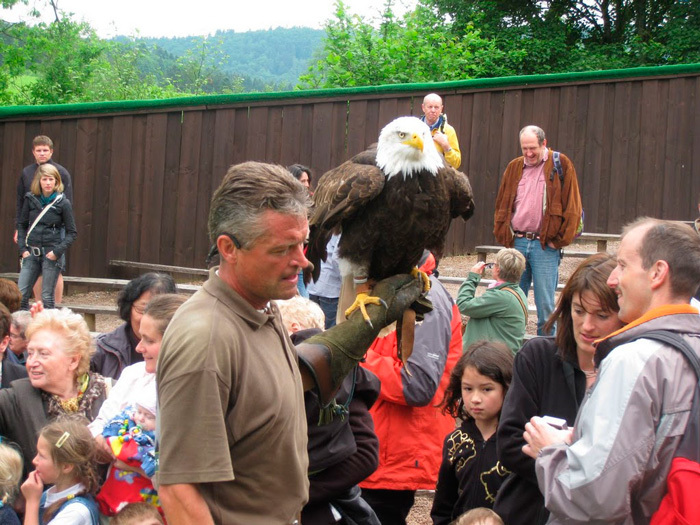 You can then tie your dog to the protective wall while the display is taking place. 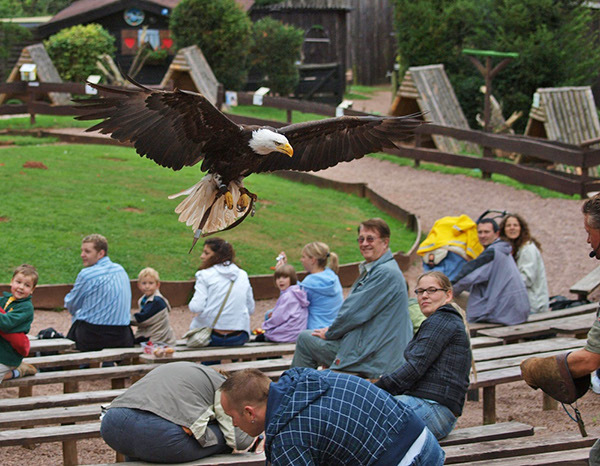 From here it is possible to enjoy fully the display also. 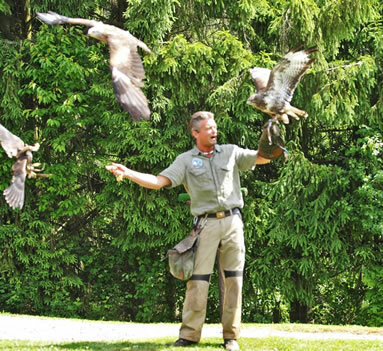 The falconer with his flying acrobats. 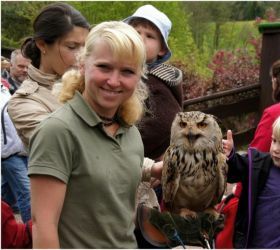 In the event of continuous rain, an alternative programme will be offered, as the birds of prey are not able to fly in the wet. 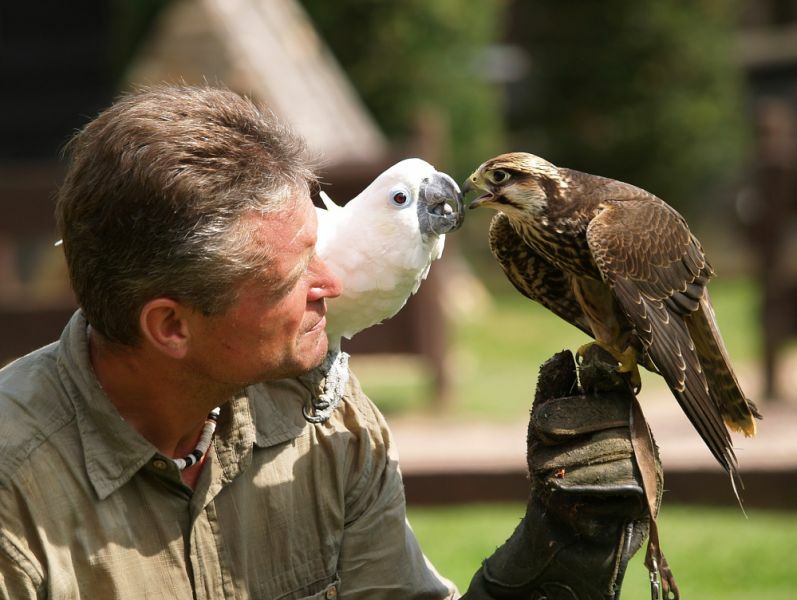 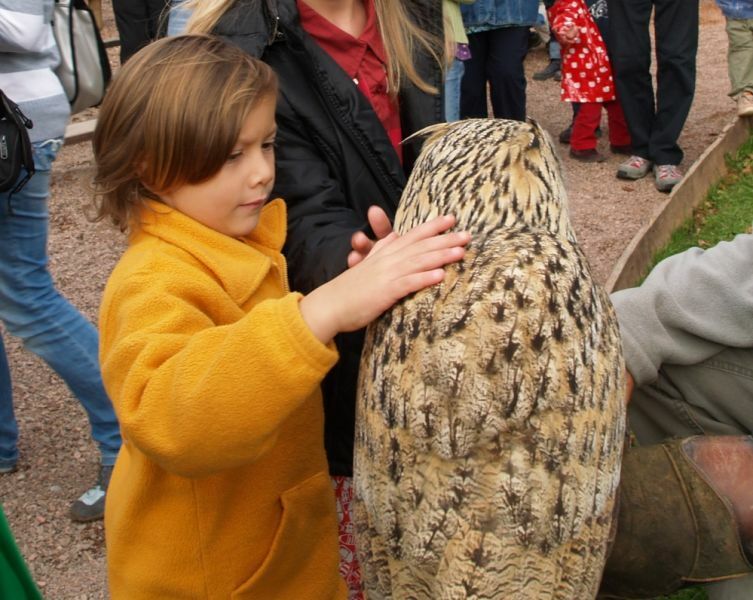 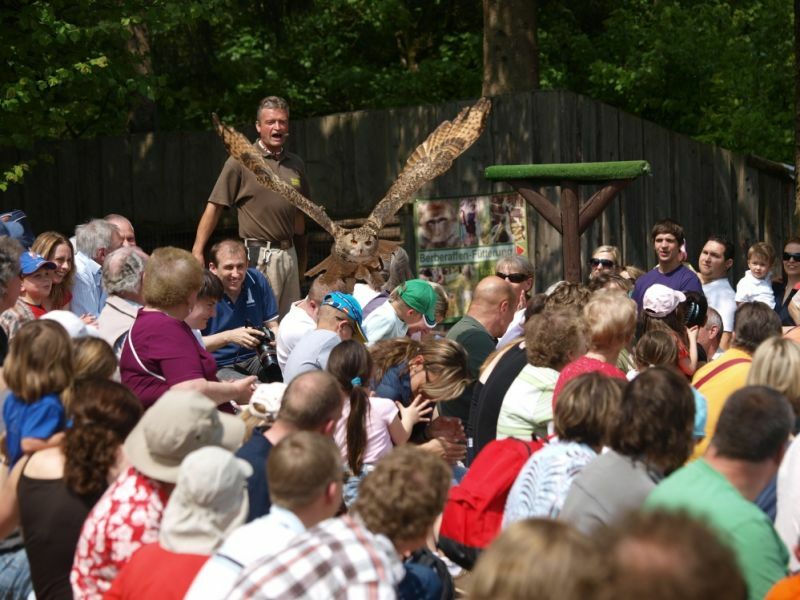 The birds of prey will be individually presented below the falconry arena near the covered pegola and all you need to know about each species will be explained in detail. 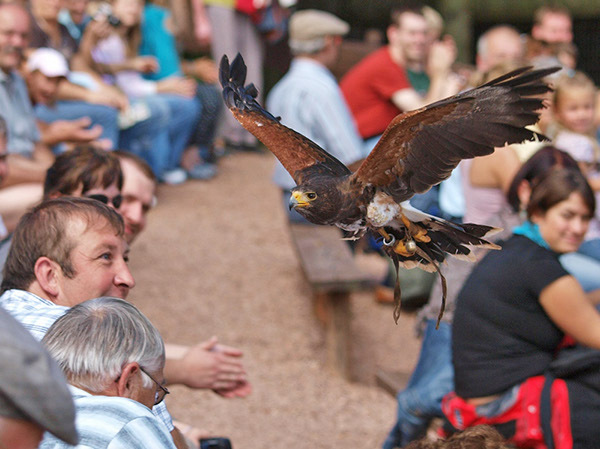 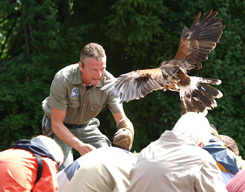 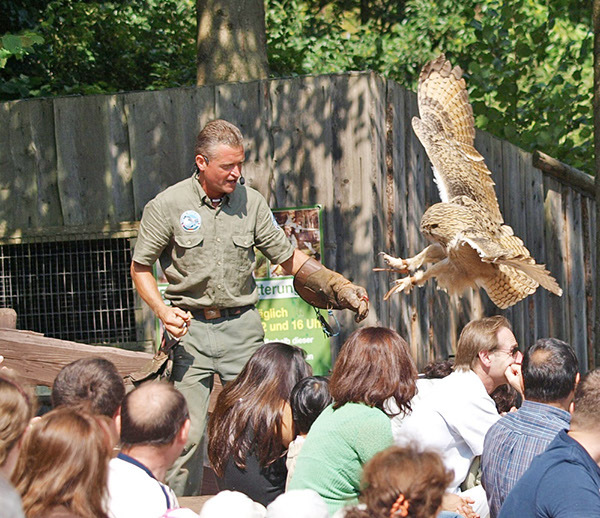 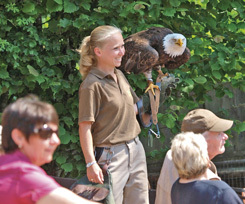 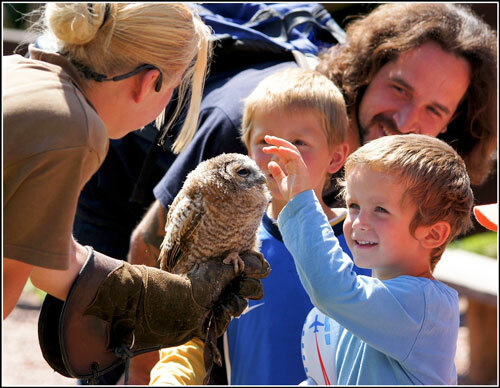 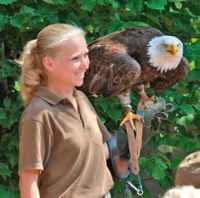 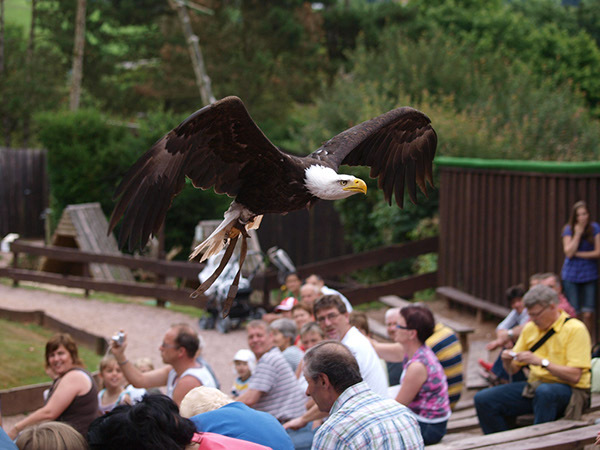 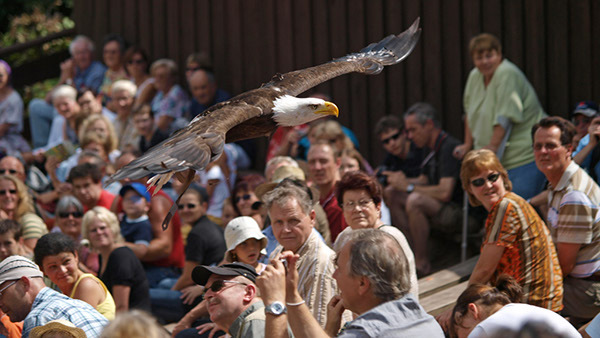 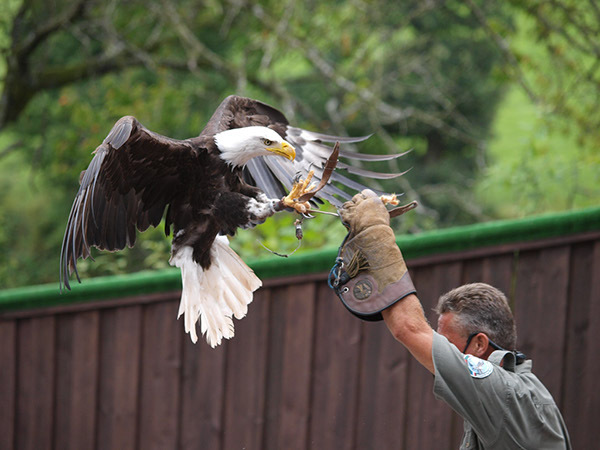 The birds of prey flying display is followed at 12noon and 4pm by the supervised feeding of the Barbary apes. 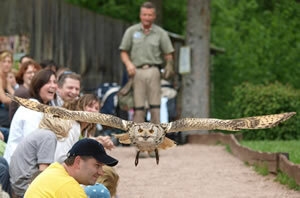 The enclosure is situated opposite the falconry arena. 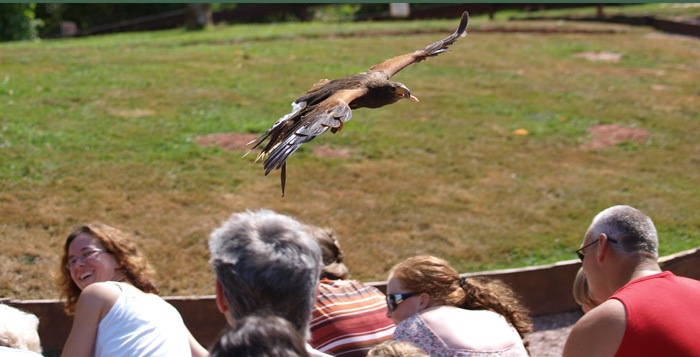 Between the two areas of the falconry arena and the Barbary apes enclosure there are open air terraces, a light refreshment stand and a cafe for light snacks. 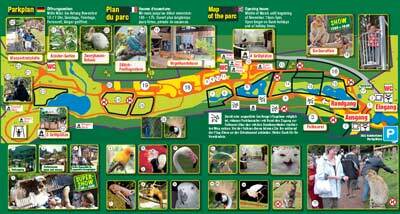 Here you have the opportunity to drink a coffee or eat a snack. 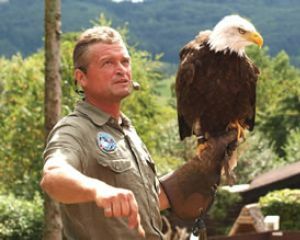 Also ideal as a present!